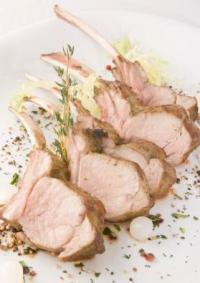 A rack of lamb recipe is versatile and flavorful. A single rack of lamb can be a delicious and romantic dinner for two or several can be cooked up to serve a group of friends. Rack of lamb recipes actually use the ribs of the lamb. There are eight ribs to a rack and a single rack can serve up to three people. 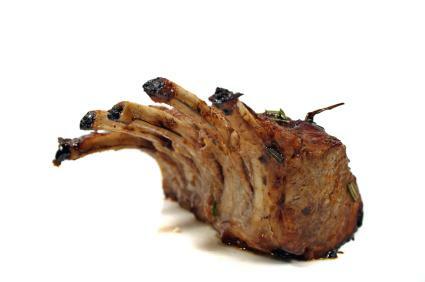 The usual serving size from a rack of lamb is two to three ribs or chops per person. The most difficult part of preparing rack of lamb is the actual butchering of the meat, but your butcher can do most of that work when you buy the lamb. You will want to ask your butcher to remove the chine bone and the excess fat from the back of the rack. You may also want to ask your butcher to "French" the rack. Frenching is when the meat between the tips of the bones is removed. This gives the rack of lamb a cleaner look and makes separating the ribs for serving easier. Once you get your lamb home, the ways to cook it are endless. Thyme and lamb are a perfect match. So much so that one of the easiest ways to prepare lamb recipes calls for just salt, pepper, and thyme. Bear in mind that lamb is best served rare or medium. Overcooking lamb makes it tough. This is a delicate meat that, when cooked properly, has a wonderful flavor. Mix the salt, pepper, and thyme thoroughly. Rub the racks of lamb with the herb mixture. Place the lamb in a roasting pan that has a rack in it to keep the lamb from resting on the bottom of the pan. Cook for 30 minutes (check at 20 minutes) or until an instant read thermometer shows 125 degrees for rare or 145 for medium. Pronounced Pear-see-yahd, this recipe adds garlic and bread crumbs to the mix. This is a great alternative to the more straightforward recipe I gave above. When cooked at a restaurant, a mixture of minced garlic, breadcrumbs, and fresh chopped parsley is packed onto the back of the rack of lamb and then browned under a salamander. A salamander is like a large broiler that is usually set above the stove and is used to brown or caramelize food quickly. Since I don't know of anyone who has a salamander in their house, I have modified this recipe for home use. Mix the olive oil, salt, pepper, breadcrumbs, and parsley. Taste the mixture and adjust the salt and pepper if needed. Rub the racks of lamb with the mixture. Place in a roasting pan with a rack and cook for 30 minutes or until done. This rack of lamb recipe calls for searing the lamb before roasting it. We sear meats for several reasons: it adds flavor, it adds texture, and it adds color. You will notice that I didn't mention that searing seals in the juices because it does not. Searing does not seal in juices. This is one of those things that someone said and someone else believed and then it became a catch phrase. Food science has disproved this myth several times. But, this is not to say that we don't want to sear meat, because we do. Rub the racks of lamb on all sides with salt and pepper. Heat a frying pan over high heat with vegetable oil. When the oil is very hot, brown the lamb racks on all sides. Place the lamb aside on a plate to cool. Once the lamb is cool to the touch, spread the mustard on all sides of the lamb. It just needs to be a thin coating. Then, spread the garlic on the lamb. Mix the breadcrumbs, thyme, and Parmesan cheese in a bowl. Coat the lamb with the breadcrumb mixture. Place in a roasting pan with a rack. Cook for 10 to 15 minutes or until 125 degrees for rare or 145 for medium.